Body Glow by SKINNY TAN Tinted After Sun Gel is a cooling aftersun formula infused with instant tan to enhance the look of your hard-earned golden glow. Soothing and softening, the formula contains Aloe Vera to help cool, relieve and hydrate your skin post-sun exposure, and is enriched with self-tan to intensify your tan. 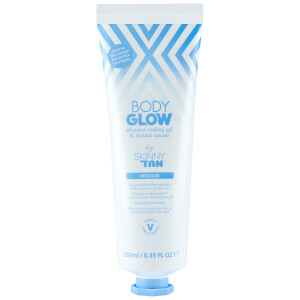 Expect soft, supple skin with a long-lasting, golden glow. Apply evenly to clean, dry skin. Wash hands with warm soapy water after use. Remove instant tanner by washing with warm soapy water when required. Re-apply as desired. Keep in the fridge for extra soothing. Note - not a sunscreen and does not protect against sunburn. Aqua, Alcohol Denat, Glycerin, PEG-40, Hydrogenated Castor Oil, Carbomer, Triethanolamine, Parfum (Fragrance), Aloe Barbadensis (Aloe Vera) Leaf Juice, Menthyl Lactate, Paullinia Cupana (Guarana) Seed Extract, Citric Acid, Sodium Benzoate, Potassium Sorbate, CI 19140 (Yellow 5), CI 16035 (Red 40) CI 42090 (Blue 1).